Opposition leader Raila Odinga has reiterated his support for the government in the war on corruption, further urging those implicated to carry their own cross. 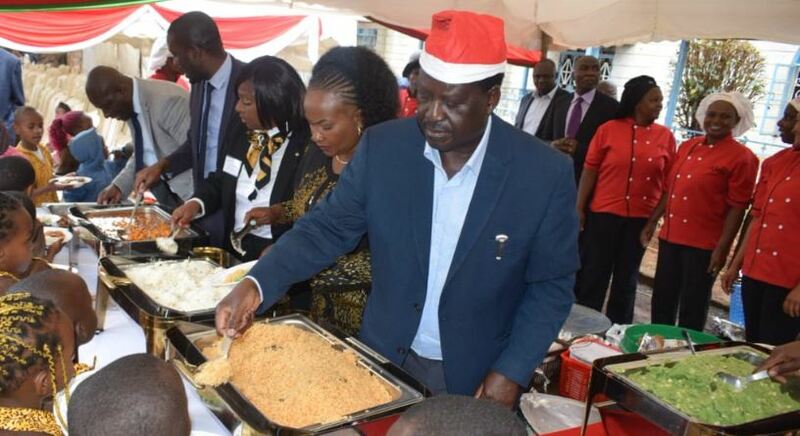 Speaking on Monday during a Christmas luncheon at P.C.E.A Kangoya Child Development Center in Kiambu, Mr Odinga dismissed claims by a section of politicians that only one particular community was being profiled in the anti-graft war. He was seemingly responding to a section of leaders allied to Deputy President William Ruto who on Sunday alleged that the war on graft was unfairly targeting one community. The former Prime Minister further implored public servants to remember that they are working for the people, advising them to be wary of corruption deals. Raila also supported President Kenyatta on his plan to reject a proposal by Members of Parliament to increase their salaries. “I support the president’s stand to reject MPs’ increment of their salaries because if it is passed it will lead to the teachers, public service, police and other workers to push for salary increment… and where will the money come from apart from burdening Kenyans?” posed Odinga. He was accompanied to the luncheon by MPs Anthony Olouch (Mathare), Tom Odege (Nyatike), ODM party secretary-general Edwin Sifuna, businessman Jimmy Wanjigi and others.